Theoretically, we humans should be better adapted physiologically to the diet our ancestors were exposed to during millions of years of hominid evolution than to the diet we have been eating since the agricultural revolution a mere 10,000 years ago, and since industrialization only 200 years ago. Among the many health problems resulting from this mismatch between our genetically determined nutritional requirements and our current diet, some might be a consequence in part of the deficiency of potassium alkali salts (K-base), which are amply present in the plant foods that our ancestors ate in abundance, and the exchange of those salts for sodium chloride (NaCl), which has been incorporated copiously into the contemporary diet, which at the same time is meager in K-base-rich plant foods. Deficiency of K-base in the diet increases the net systemic acid load imposed by the diet. We know that clinically-recognized chronic metabolic acidosis has deleterious effects on the body, including growth retardation in children, decreased muscle and bone mass in adults, and kidney stone formation, and that correction of acidosis can ameliorate those conditions. Is it possible that a lifetime of eating diets that deliver evolutionarily superphysiologic loads of acid to the body contribute to the decrease in bone and muscle mass, and growth hormone secretion, which occur normally with age? That is, are contemporary humans suffering from the consequences of chronic, diet-induced low-grade systemic metabolic acidosis? Earlier studies estimated dietary acid load from the amount of animal protein in the diet, inasmuch as protein metabolism yields sulfuric acid as an end-product. In cross-cultural epidemiologic studies, Abelow found that hip fracture incidence in older women correlated with animal protein intake, and they suggested a causal relation to the acid load from protein. Those studies did not consider the effect of potential sources of base in the diet. We considered that estimating the net acid load of the diet (i. e., acid minus base) would require considering also the intake of plant foods, many of which are rich sources of K-base, or more precisely base precursors, substances like organic anions that the body metabolizes to bicarbonate. 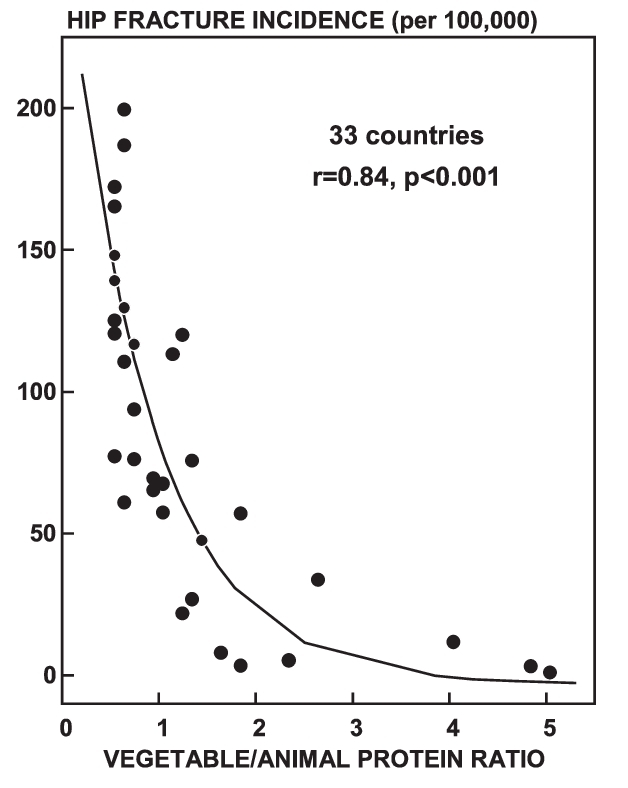 In following up the findings of Abelow et al., we found that plant food intake tended to be protective against hip fracture, and that hip fracture incidence among countries correlated inversely with the ratio of plant-to-animal food intake. These findings support affirmative answers to the questions we asked above. … A more difficult question is what level of acidosis is acceptable. We argue that any level of acidosis may be unacceptable from an evolutionarily perspective, and indeed, that a low-grade metabolic alkalosis may be the optimal acid-base state for humans. So … Too much animal protein and not enough plant food result in a low-grade metabolic acidosis which contributes to osteoporosis, decline in muscle mass, kidney stones, reduction in growth hormone, and possibly decline in renal function – all of these being more profound as we age (because the kidney becomes less effective at buffering). Using bone as an example … Look at this graph. People with the lowest veg/animal protein ratio (low veg intake, high animal intake) had the most fractures. People with the highest ratio (high veg intake, low animal intake) had fracture rates approaching zero. Metabolic acidosis induces nitrogen wasting in part by directly increasing the rate of protein degradation in skeletal muscle, without commensurately increasing the rate of protein synthesis [75,76]. Although the degree of diet-induced, age-amplified metabolic acidosis may be mild as judged by the degree of perturbation of blood acid-base equilibrium from currently accepted norms, its pathophysiologic significance cannot be judged exclusively from the degree of that perturbation. Adaptations of the skeleton, skeletal muscle,kidney and endocrine systems that serve to mitigate the degree of that perturbation impose a cost in cumulative organ damage that the body pays out over decades of adult life [89,90]. I don’t think this article will appeal to many people. It’s not just the language; it’s that it’s not intuitive. People ask … “How can it be that high-protein diets lead to muscle loss, and not muscle gain?” It can. And these authors did a great job of explaining. This entry was posted in Uncategorized on March 11, 2018 by Bix.